Was the driver chemically impaired? Home > Articles > Medical Record Analysis > Was the driver chemically impaired? A young lady was the driver of a van when her vehicle was struck from behind. The force of the impact caused her to be thrown from the van. A blood sample taken from the driver showed a level of 0.035 mg/liter of Morphine, leading the attorneys to conclude that she was impaired at the time of the accident. A young woman was brought into the emergency room following an accident. Her face was swollen and there was a dressing under her nose. Her urine contained 0.4 mg/liter of benzoylocgonine, a metabolite of cocaine, leading the attorneys to conclude that she was impaired at the time of the accident. It was likely that she was already manifesting cocaine addiction symptoms before the accident. A man was driving through an intersection when his car struck another. His emergency room record stated “AOB” and the physician progress notes stated “+ETOH.” A BAC was ordered. The attorney representing her wanted to know what these terms meant and if he was impaired when he was in the accident. The determination of impairment rests on a careful analysis of specimen values and timing. In the first situation, it was tempting to conclude that the driver had taken either heroin or morphine prior to the accident. Heroin metabolizes into morphine, and got its name because it was the “heroic drug” that was supposed to save people from opium addictions. Heroin can be injected or inhaled, and shows up in the blood and urine as morphine. In this case, the driver denied using heroin before the accident. The question of timing of the specimen was crucial. Review of the emergency room record shows that the patient received 5 mg of morphine intravenously at 9:00 AM in the emergency room. The blood specimen taken to test for drugs was drawn at 9:30 AM . Until we pointed out the timing, the attorneys had not realized that the patient was given morphine in the emergency room before the blood was removed. In the second situation, the substance in question was cocaine. This substance can be chewed, sniffed, injected, or smoked, yielding different levels of cocaine depending on the dose taken. Benzoylecgonine is present in the body for 2-3 days following use of cocaine. Benzoylecgonine peaks in the urine within 4-8 hours and diminishes slowly to an average of 0.4 mg/liter for 48-72 hours. The answer to whether this woman was impaired, and how she got cocaine, was found in her surgical history. At first, the emergency room personnel assumed that the First Aid Squad had applied a dressing to the nose of the patient. However, when the patient was questioned, she said she had a nose job two days before. A submucous resection (or “nose job”) involves the use of cocaine to constrict the blood vessels in the nose. The application of cocaine to her nose resulted in detection of benzolecgonine on the day of the accident. It was unlikely that it had any effect on her ability to drive two days later. In the third situation, our skill in deciphering medical abbreviations led us to the conclusion that the emergency room personnel smelled alcohol on the patient’s breath. AOB stands for “alcohol on breath.” ETOH is the chemical formula for ethyl alcohol, hence a + (positive) ETOH has the same meaning as AOB. 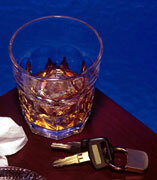 To determine the patient’s blood alcohol level, a BAC (blood alcohol concentration) was ordered. This test, also referred to as BAL (blood alcohol level) was .09. The driver said he was in a bar drinking wine before the accident. Using a blood alcohol concentration calculator and her recorded weight of 170, it could be determined that he had to have consumed at least five 3.5 ounce glasses of wine to result in this blood alcohol level 1 hour after leaving the bar. With the national push to define a BAC of .08 as impaired, there is no question that he was impaired at the time of the accident. Evaluation of toxicology results is made easier with a legal nurse consultant and standard references such as Baselt, Randall, Disposition of Toxic Drugs and Chemicals in Man, and Garriott, James, Garriott’s Medicolegal Aspects of Alcohol, which comes with a blood alcohol concentration calculator. Contact us for help with deciphering these issues for you.